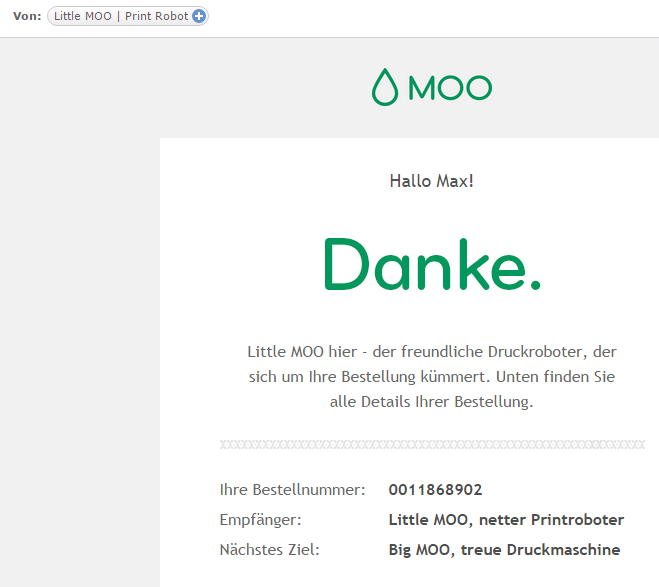 Little MOO, the Friendly Print Robot – That’s Customer Experience! Recently, I’ve ordered a set of new business cards online and shortly thereafter, I received a confirmation e-mail from Little MOO, the friendly print robot. He told me that he had received my order and was forwarding it to Big MOO, the loyal print machine. Immediately, I had to think of a little robot looking a bit like WALL·E doing some paperwork concerned with my order—and let’s be honest: that one’s pretty cute.